All the staff at at Dr. Joy Dental Clinic would like to congratulate CEO and Chief Orthodontist, Dr. Joy Antony on being presented with the Invisalign® Diamond Provider award for the UAE. This is the highest accolade from Invisalign® and is based on the number of Invisalign® treatments carried out by Dr. Joy. The award signifies Dr. Joy’s extensive knowledge and experience in treating patients with Invisalign®. 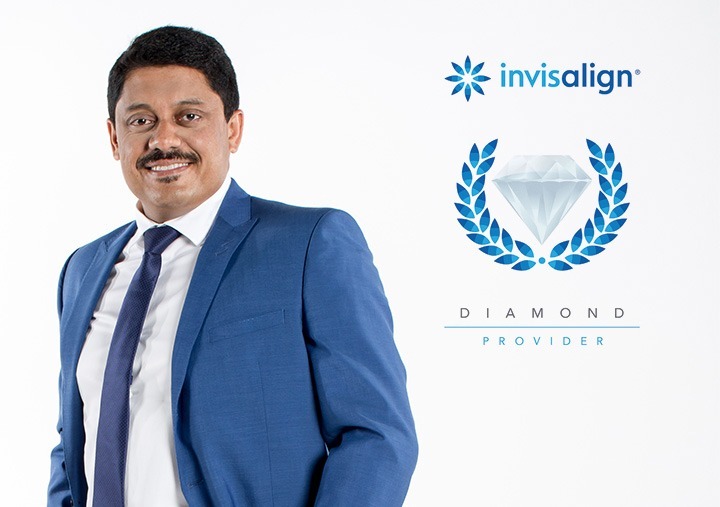 Being recognized as an Invisalign® Diamond provider is a great achievement. For his accomplishment, Invisalign® has invited Dr. Joy to visit their production facility in San Jose, Costa Rica to learn about their latest technologies. Invisalign® is the revolutionary system from Align Technology USA and has transformed the way we practice Orthodontics. Invisalign® straightens your teeth without wires and brackets, using a series of clear, customized, removable appliances called aligners. It is virtually undetectable, which means hardly anyone will know that you’re straightening your teeth. The Invisalign® orthodontic system combines advanced 3D computer graphics technology with 100-year-old science of orthodontics. Invisalign® aligners are designed to move your teeth in small steps to the desired final position prescribed by your orthodontist. Each aligner is precisely calibrated and manufactured to fit your mouth at each stage of the treatment plan. We would like to again extend our congratulations to Dr. Joy on this great achievement and wish him the best of luck on his visit to Costa Rica. Next post: Are you experiencing dry mouth?